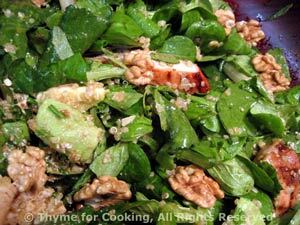 Chicken, Spinach, Quinoa, Avocado Salad, Thyme for Cooking main course salad. Pour marinade over chicken and set aside. Add asparagus and boil for 3 minutes (4 for white). Remove, drain. Cook chicken on barbecue grill over direct heat for 8 - 10 minutes per side. Or cut into strips, toss with Teriyaki sauce and stir-fry in nonstick skillet in 1 tbs oil for 4 - 5 minutes. Slice avocado. then cut it into large cubes. Wash and spin-dry spinach if needed. If it's not pre-washed, fill a sink with water, add spinach and swish to clean. Drain and spin in salad spinner. Tear any large leaves. Prepare spinach and put into large salad bowl along with the herbs. Toss with about half of the vinaigrette - be careful not to use too much to start. Fluff the quinoa and spoon it around the spinach. Toss lightly to distribute. Add chicken, avocado and walnuts. Toss lightly. Taste, add more vinaigrette if needed, and serve, any remaining vinaigrette on the side. In a small bowl whisk vinegar, soy sauce and mustard. Note: We only used about 2/3 of this - but we like lightly dressed salads.